Been watching footage of Glastonbury over the last couple of days, really wish that I had managed to get tickets as from reading the preview in NME and seeing the lineup I am envious of those who attended. I watched Amy Winehouse yesterday and she amazes me, she has a unique voice but the way she staggers about it makes me wonder where it is all leading. Still she provided a great performance although this was marred by her attacking a fan who supposedly pulled her hair. I wasn't sure what I had seen when I watched it on BBC2 but I checked the Internet afterwards and reports were coming through confirming what I thought. The big story from this years Glastonbury has been the decision to have Jay Z headlining. Admittedly it was a risk as the festival isn't known for it's Hip Hop ties but having watched the above clip it seems that Jay Z answered his critics. I personally don't have a problem with him headlining as I am not a follower of one set genre instead I like to listen to as much variety as possible. Noel Gallagher on the other hand resented that a Hip Hop artist was the headline act. You have to hand it to Jay though; walking out on to the stage to Oasis Wonderwall was a move that proved to be affective and set him up for what reports say was a good performance!! Be interesting to see where the festival will go next and Amy Winehouse has stated that she would like to headline next year, we shall see!! Football today was a riot as trying to hype my Son up on the journey was a real laugh, in the car I was talking to him about scoring and using all his energy to play. Players listen to music to get them in the mood so our choice was the Captain Jack Sparrow tune. He was well on it, rocking his Captain armband and telling me how much of an impact he was going to make. He did well, playing more matches than the other children and only really losing interest towards the end. After dropping him off at my Partners, I headed to Horse Riding with the eldest. She is really confident now and was hoping that she would be able to ride around on her own without an aide but they didn't let her. I don't think it will be too long as she listens to everything she is told and the main trainer is full of praise. After the morning adventures I settled in the garden to finish the work on the Playhouse. My partners father is amazing with his carpentry, in the time it took me to cut enough small sections to put around the door he had built the door. We worked together and I only missed the nail once but that time I missed I hit his nail. With that said I think we were a good team and the end product is looking good. All it needs now is the paintwork finished and I am moving in!! Today we celebrated my Dad's birthday, I spoke to him late in the afternoon and he was indoors putting up some banners. He does make me laugh with his ways and I feel that the years have been good to him as he hasn't really aged. Either that or my perception of him and my mother remains the same since I was in my youth. I still see both of them as being quite young but the truth being I will be entering the age bracket they were in as I was a teen within a few years. My mother summed it up well as she said to me that you're as young as you feel and I believe that to be true! The night was good and we had a lot of fun, it wasn't my weekend to have the older children but with their mother working it made sense for them to stay with me. I played in the garden with all the children and in a nod to the festival season we ended up running around inside a tent. Try and create an image of this as I am afraid that no one was at hand to capture the moment although I am sure that my sister ceased the opportunity!! 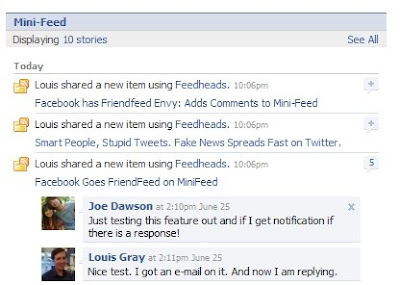 Facebook announced on their blog earlier today that they were to be adding the ability to comment on items in your Mini-Feed. This is now available and I have been testing replies with Louis Gray on his Mini-Feed. Those actively using FriendFeed will be familiar with this feature as the site has always allowed comments on our shared items. It's a welcomed addition to Facebook and expected as since they opened up the Mini-Feed to allow Imports these site feeds have remained largely static. Allowing the comments works well, I posted on a story and Louis received an email telling him that I had commented on his item. When he responded I received a notification on Facebook informing me in much the same way as someone commenting on a photo or video of mine! FriendFeed has been hugely popular and Facebook has obviously taken notice and seen that lifestreaming is the way forward. So should FriendFeed be threatened by Facebook's advances? I don't think so, not yet anyway as where FriendFeed is engaging I still don't see where I would feel the need to check my friends Mini-Feed other than if I were on their profile to post on their Wall. For this to take off they would need a central area for all of our friends activities to display. Another area for improvement is with the ordering of items commented on in the Mini-Feed. In commenting on an item it should naturally push it to the top, unlike FriendFeed; Facebook only has 10 stories displayed so if you are highly active you only have a short time frame of exposure for your story. Then it goes back to your friends actually seeing the shared item as there is no way for them to be notified that you have an active story in your Mini-Feed. The Facebook homepage is an area that could be used to display more friends stories but currently this has no way to add comments to my friends items. I still have to go to their profile to comment which isn't ideal as it defeats the purpose. I know this may come across as negative but that isn't what I am trying to get across as I am impressed with this development. The points that I make are just my initial impressions, Facebook is moving in the right direction by adding this ability to comment. FriendFeed is way out in front as the site aggregates from a lot more services and enables us to interact in many different ways and with people who aren't neccessarily people we subscribe to. With Facebook I feel that it won't be our imported stories that receive the comments from the majority of users it will be the Status Updates! This appears to be an area that the Facebook developers are working on though so it will be interesting to see how the interaction changes over the coming months!